Usually this page is an autobiographical précis of the author, a portrait of the artist as a young chick. But you are fortunate, dear reader, to catch me while i am trying to figure out what I am about. In 1995, after a life-changing experience in St. Thomas where my husband and I survived a Category 3 hurricane (Marilyn) during our honeymoon, I vowed that I would conquer something that had always fascinated and frightened me: the computer. A week after returning to New York, I enrolled at the Courant Institute of Computer Science at New York University, and in 1998, graduated with a Master’s Degree in Computer Science. While there, I befriended someone whom I consider a mentor and life-long inspiration for humanizing the computer: Professor Ken Perlin. To this day, I consider it a privilege to have studied and worked with this deeply intelligent, complex, creatively driven man with the intellect of a god and the quick delight of a child. He had won an Academy Award for his work. He was revered on campus and around the world. He worked on, and continues to work on, hundreds of projects, and yet no detail escapes him. 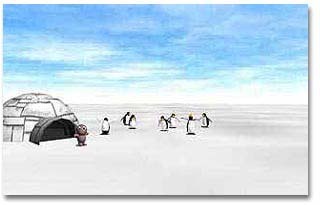 I remember having worked hours and hours on animating several penguins on these huge purple Silicon Graphics IRIX machines — getting these penguins to move their heads in a swivel like Janet Jackson. I thought I was clever and showed him as soon as I got it working. He took one look and said immediately, “These must be vampire penguins because they have no shadows.” I had ambient light; surely I should have added shadows. I was one of Ken’s many grad and post-grad students and technicians who worked on the computer-generated Sid and the Penguins, and I was one of the lucky few who traveled to Disney World to present our animation for the annual conference on computer graphics, SIGGRAPH 1998. The Disney World SIGGRAPH 1998 is worthy of a blog post unto itself. The experience of working at the Media Research Lab (or MRL) in the heyday of New York’s “Silicon Alley” was one of the most intensely creative, emotionally invested times of my life. I worked there part time, while finishing my last year in grad school, but there were days when I worked twenty hours a day, especially when we were finishing those last bits of “Sid.” There was so much happening and so much that we wanted to do, we wanted to bring attention to the magic and invention being generated at the lab — attract companies, venture capitalists, and prospective partnerships with other universities and labs. And thus, Ultraviolet, the NYU Media Research Lab’s technical innovation showcase, was born. It picked up momentum and became a yearly event; you can read an official press release of the 1999 Ultraviolet here. You can tell that my time at New York University — though only three years of my life — was one of the highlights of my life. You can see me in the Media Research Lab’s list of “Old Friends Who Have Left Us” (as Louella Dizon). My girls still have a large pink teddy bear that they got from their “Uncle Ken,” and they love to visit his website and its wonderful animations (example: click on the sheep below, let it load, and have fun). And then in August of 1998, I grew up, and got a job at Morgan Stanley, in technology. You can see my C.V. from my LinkedIn link at the bottom of this page. It’s been a challenging, interesting and rewarding experience in its own right. But yes, it is not Disney World. The girls and I are so proud of you and the completion of your book! There may be a few more rounds involved, but I think this step is a huge step towards what you want in the creative part of your life. I may not say it enough, or maybe I’ve never said it to you, but I think you’re one of the most talented people I’ve ever had the pleasure of knowing. It makes me so happy to see how it gives you great joy and feeling of accomplishment. And, the girls and I are glad you keep us involved in the process. Congrats on the new blog too. Very nice! Love your pages!